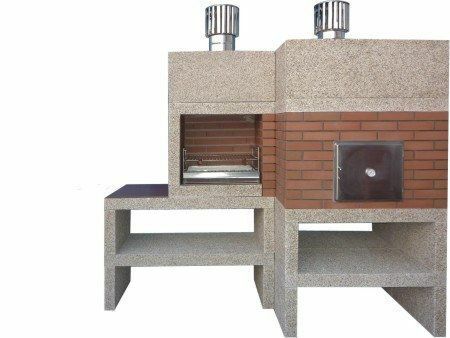 Modern Barbecue with Oven AV950F. Free shipping to England, metropolitan France*, Monaco, Belgium, Luxembourg, Italy and Spain. For other destinations please contact us. Bell pepper, zucchini and fresh tomato sauce give this vegetarian pizza a taste of summer. 2.Grill zucchini until marked and softened, about 4 minutes. Thinly slice. Reduce heat to low. 3.Process tomatoes, tomato paste, basil, oregano, salt and pepper in a food processor until smooth, scraping down the sides as needed. 4.Sprinkle cornmeal onto a pizza peel or large baking sheet. Roll out the dough and transfer it to the prepared peel or baking sheet, making sure the underside of the dough is completely coated with cornmeal. 5.Slide the crust onto the grill rack; close the lid. Cook until lightly browned, 3 to 4 minutes. 6.Using a large spatula, flip the crust. Spread the tomato mixture on the crust, leaving a 1-inch border. Quickly top with mozzarella, bell pepper and the zucchini. Sprinkle on Parmesan. 7.Close the lid again and grill until the cheese has melted and the bottom of the crust has browned, about 8 minutes. Light 6 quarts (about 1 large chimney starter full) of charcoal and burn until the coals are mostly white, about 20 minutes. Spread the coals in an even layer. Place a grate over the coals. Let the coals burn until they are about medium-low. (Grill any toppings for the pizza while the coals are burning down.) To test the heat, hold your palm about 5 inches above the grill rack; if you can hold it there for about 8 seconds before you need to move it away, the fire is medium-low. Transfer the crust to the grill rack, cover the grill and cook the crust, checking once or twice, until lightly browned, 3 to 4 minutes. Flip the crust, quickly add the toppings, cover the grill and cook until the toppings are hot and the bottom of the crust has browned, 5 to 8 minutes. If your crust browns faster than your toppings are cooking, slide a baking sheet under the pizza to keep the crust from burning while the toppings finish.